Strictly, 'herbaceous' plants lack a woody stem and die down at the end of the growing season, or forever if the plant is an annual. However, herbalism cannot be adequately defined in terms of a specific botanical group of plants that is used for medicinal purposes because the scope of 'herbal' treatments and supplements is sometimes extended to include the use of other plant or plant-like matter such as lichens, fungi, roots and vegetables are outside what may formally be called herbs. Herbalism is therefore often considered rather loosely in terms of plants and other naturally occurring growing species that are useful to mankind - but - 'herbal' treatments or remedies are sometimes even extended to include other natural materials such as bee products and even shells and minerals. Pharmacognosy is the correct term for the the study of all medicines derived from natural sources. 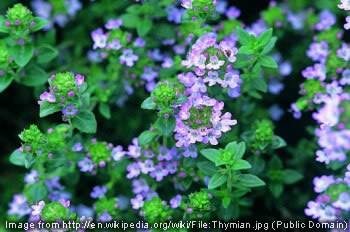 Above: Thyme is an example of a plant that has been used for medicinal reasons. In this case, the essential oil of common thyme, contains 20-54% thymol, which is a powerful antiseptic and antifungal. Before modern antibiotics were widely available oil of thyme was used to medicate bandages. Other uses of thymol have included treatment of respiratory infections such as coughs and bronchitis. Which part(s) of the plant(s) to use. Different parts such as the root, bark, leaf, fruit, and flower generally have different properties. The dosage that should be given. For how long, and in what quantities the remedy should be administered. The form in which the preparation should be administered e.g. orally or as creams or poultices for example. There might be complicated issues concerning the individual recipient and his or her condition. A combination of plant species might be appropriate and might involve specialist knowledge to select, formulate and prepare. The use of a single plant species is known as a 'simple'. Appropriate herbs, prepared and administered correctly may help with a wide range of problems. In the early stages of human history many aspects of life such as diet, clothing, and broader cultural development utilized increasing knowledge of plants, wild fruits, trees, and flora generally. Ethnobotany is the scientific study of the relationships between people and plants and is still considered an effective way to discover possible future medicines. The use of plants for medicinal purposes was recognised in India over 2000 years ago. There are also ancient Chinese records of the use of herbal remedies. The Greek historian 'Pliny the Elder' said that the Greeks produced both written and pictorial records of herbal treatments as early as the 1st Century BC. The Byzantines (in modern day Turkey) produced similar records in c. 500 AD. From the Middle Ages (ca 1100-1450) onwards numerous European scholars documented and illustrated a wide variety of plants together with accounts of their medical benefits. Knowledge of the uses and effects of plants grew rapidly. Awareness of their remedial properties for a variety of health conditions, of their hallucinatory properties, of their soporific and stimulating effects, and so on, encouraged the emergence of professional experts and a widespread interest that has continued to the present day. During the centuries of global exploration, colonial expansion, increasing trade, and improved communications (C16th - C19th), numerous 'new' plants were added to those known in Europe. The dominance of urban/industrial society (especially in Europe and North America) of the last two hundred years, together with increasing formalization of scientific knowledge coincided with a decline in use of some traditional remedies and the medical use of natural herbs generally. Increased availability of modern synthetic pharmaceutical products also contributed to obscuring the importance and contributions of herbal treatments. For more information see the history of herbalism. Herbal remedies are increasingly available from many sources such as dispensing chemists (which are called "pharmacies" or "drugstores" in North America). This is part of a general trend of increasing interest in more 'natural' approaches to health and wellness. In Europe, North America and elsewhere herbal remedies are increasingly used to treat mild conditions and as dietary supplements that are widely considered to be ecologically friendly and less likely to lead to undesirable side-effects associated with chemically-constructed synthetic products. In addition to the increasing revival of interest in herbal treatments in developed countries, the use of herbs to treat disease is still widespread in non-industrialized societies where, in many cases, it was not displaced by modern pharmaceutical drugs to as great an extent as in more economically developed countries. In many parts of the world, including large areas of Asia and Africa, herbal medicines are often more affordable than modern pharmaceuticals and are commonly used for at least some aspects of primary health care. What does a Herbalist Consultation / Treatment involve? As with all medicines, there are circumstances in which specific herbal preparations should not be used (that is, are contraindicated) for particular individuals. Also as with other substances, some herbal preparations can cause allergic reactions in some people. Herbalists take these, and other considerations, into account when recommending remedies for individuals. See also books about herbalism.